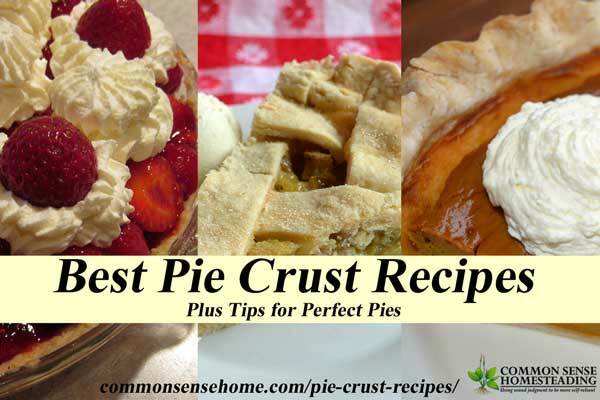 The best pie crust recipes start with the best ingredients, handled with care. Basic cookies and cakes are easy, but a perfect pie crust really shows off the skills of the baker. Pies have always been a part of my family's holiday traditions, and we also baked many pies at our family catering business, so over the years I've made a lot of pie crusts. 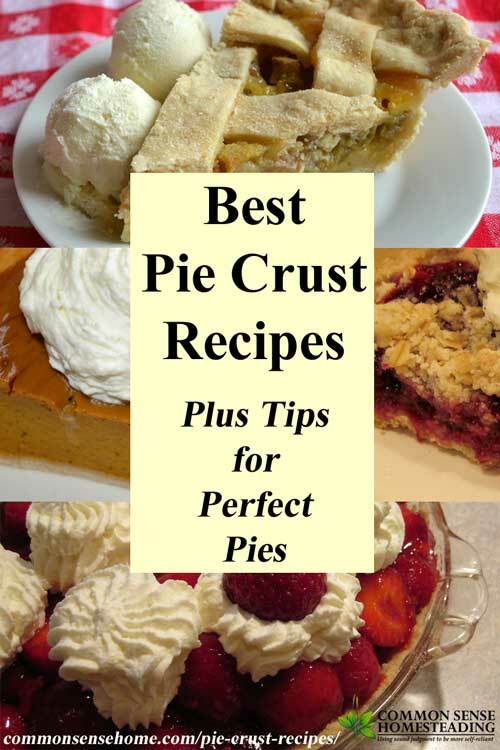 These are some of my favorite “go to” pie crust recipes, along with tips for perfect pies. I've also included links to the pie recipes currently on the website. The nut, shortbread, coconut, graham cracker and cookie crust recipes make enough for a generous 9-inch pie crust or a thinner ten inch pie crust. This pie crust recipe with vinegar is the one my mom used for as long as I can remember. The vinegar makes it lighter. (I tried vodka like they recommend on some foodie sites. Vinegar is better.) The egg makes it a little more elastic and easier to form. It makes enough for 3-4 for crusts, depending on how thick you roll the dough. It can be made ahead and refrigerated or frozen. Cut together flour and lard with a pastry blender to form pea sized bits. Mix other ingredients in a separate bowl, then cut into flour mix with a fork. Mix until just blended. Chill before rolling out between two sheets of wax paper or on a pastry cloth. Makes 3-4 pie crusts. Combine the ground nuts, butter and sugar. Press the mixture evenly into the bottom and sides of a 9-inch pie plate. Bake at 350°F for 5 to 7 minutes to precook crust before final bake. Combine the oil and coconut meat. Press the mixture evenly into the bottom and sides of a 9-inch pie plate. Bake at 350°F for 5 to 7 minutes to precook crust before final bake. Sift flour and sugar together into mixing bowl. With pastry blender, cut in butter until mixture resembles cornmeal. Chill 30 minutes. Then press firmly into 9 inch pie pan. Pre-bake at 350°F for 5-7 minutes. Mix graham cracker crumbs and sugar in a medium mixing bowl. Add butter and mix thoroughly. Press mixture firmly and evenly against bottom and sides of pie pan. Bake 10 minutes at 350°F. Cool and fill with whipped or custard filling. Works just fine with gluten free graham crackers. Make Graham Cracker Crust as above, but substitute chocolate or vanilla wafer cookies or gingersnaps in place of graham crackers. Always keep your pastry crust ingredients cold. The bits of cold fat (lard, butter or shortening) melt of form air pockets during baking. If your fat melts during mixing, no pockets, no flaky crust. Always work your pastry crust gently to preserve those fat pockets. Blend until just combined. Too much handling makes the dough tough. This also applies for shortbread crust and shortbread cookies. Roll the pastry dough to the correct size – don't stretch it! If you stretch the dough, it's more likely to shrink back during baking and slip into the pan. If making custard pies with a pastry crust, prebake your crust with wax paper and pie weights or a pie weight chain to keep the unfilled crust from puffing up. Crimp pastry dough just slightly around the edge of the pan to help keep it from slipping down into the pan. Glass pie plates are my preferred baking option, because they transfer heat more evenly, and the pie will not pick up a metallic taste from the pan. Leave a comment to share your favorite baking tips or stories, or any questions you have about baking pies or recipe requests. Originally published in 2009, updated 2016. Shawntele, you have got to try it. It's a dying art, and homemade pie tastes SO MUCH BETTER than store bought, even on the simple stuff. If you want to start simple, try the homemade shortbread crust, bake it completely for 15-20 minutes at 325 F until it is lightly browned, then fill as usual. Wow, that looks delicious! Your raspberries looks amazingly yummy! Thanks so much for the crust recipes! I have never made a crust before, but your recipes really inspire me. The raspberry cream pie looks so delicious! I love my pie crust shield! It's so much easier than trying to use foil or some other way to protect the crust. We have so many raspberries, I have been looking for the perfect pie recipe. I think I found it. Thank you! Thank you! my current recipe is 1/2 lard, 1/2 butter, 1/2 whole wheat and 1/2 KAF special flour. I like it. My family likes it. One thing I have found is that although I may LOVE my recipe and my family too…others find it doesn’t match what they “know”. Meaning how their mother/grandmother used to make it. So I stopped saying how good my pies are. If they like it, great. If it doesn’t match what they “know” then they are usually polite about it and I am none the wiser and happier all the same. Actually, I have found that is also true with all “comfort” foods. If it isn’t how mom/grandma made it…then for that person, it isn’t as good as you may think it is…so for meatloaf, mashed potatoes, pies, cookies, etc.. I also use ice cubes in my water to chill it thoroughly and I freeze my marble rolling pin to make it easier. I use to use a pastry cloth but have switched to a graded silicone mat from PC. I have tried to share with young people…you know 20 to 30 y/o’s.. this dying art of pie making from scratch and haven’t found anyone who is interested. So, hopefully you will encourage some from that generation to take up the practice. I know the KAF blog has lots of tutorials and there are plenty of folks on that blog but it’s KAF. So, I am so glad to see you post about it. Wish I could taste your pies and pastries in person. I learn new stuff all the time. My default for company is standard KA all purpose. For home I’ve been using Namaste gluten free flour, but, boy, that can be tough to work with. It’s so crumbly that it’s a real challenge to make a crust without it falling apart. For fat, it’s either lard or half lard/half butter. The butter melts even quicker than the lard, so keeping everything cold is even more important. We always rolled between two sheets of waxed paper, so I thought that’s how everyone did it. I really need to make time to make a video soon. I don’t know how the ladies who regularly do videos make time to do the videos and their regular cooking. Okay – yes I do – most of them have someone else record and edit the video. I need minions!